The Lion’s Share: A Tale of Halving Cake and Eating it. By Matthew McElligott. Walker, 32 pp., $16.99. Ages: See discussion below. A children’s librarian suggested I read this book when I couldn’t find Jerry Pinkney’s The Lion and the Mouse, and I’m not sorry she did. The almost-too-cute homophone in the subtitle — halving your cake — is the sort of device that can bode ominously. And the wordplay doesn’t end there. 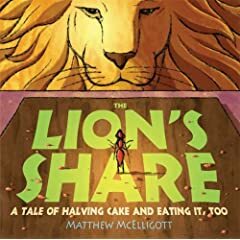 The Lion’s Share is a literary triple-layer cake — a fable, an etiquette lesson, and an introduction to fractions — about a lion who shares the lion’s share of his triple-layer cake with an ant and other animals. But Matthew McElligott integrates the wordplay well into in a story amusingly illustrated with digitally enhanced ink and watercolor. And he offers lively lessons in fractions, and practice in counting to 256, as all of his creatures except the lion and the ant make pigs of themselves at dinner. In a tale with an Aesopian flavor, an ant who politely waits her turn for cake seems at first to lose but wins in the end. Best line/picture: McElliggott devotes one page to nothing but pictures of 256 peanut-butter cakes and makes it interesting. Ages: In schools this book is most likely to be used in grades 1–3. But it would suit any child who hasn’t outgrown picture books and is starting to learn multiplication and division. Furthermore: McElligott teaches at Sage College in Albany, NY. Besides a lion and an ant, The Lion’s Share involves a beetle, frog, macaw, warthog, tortoise, gorilla, hippo, and an elephant. You can also follow Jan Harayda on Twitter. She comments on books at www.twitter.com/janiceharayda and satirizes American literary culture and the publishing industry at www.twitter.com/fakebooknews.